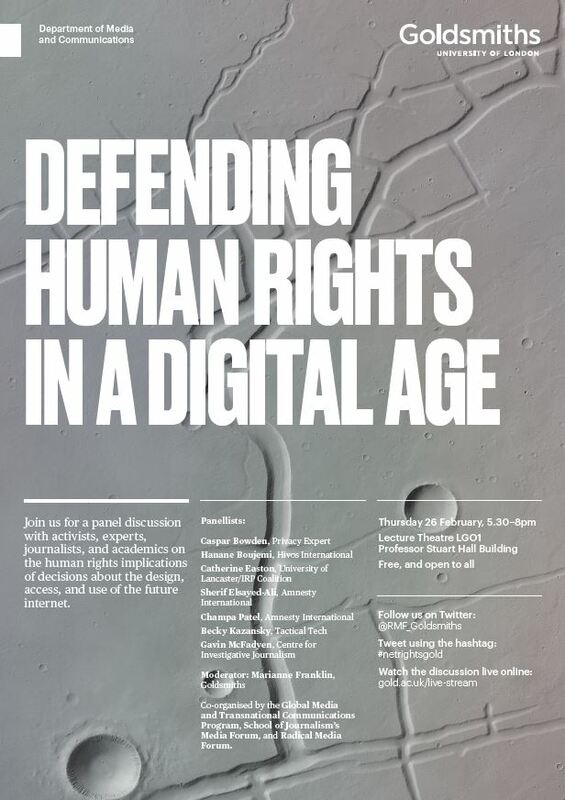 This panel addresses the human rights implications for the future of the internet as struggles over its ownership and control gather steam at the national and international level. The internet-dependent world is still dealing with the fallout of Edward Snowden’s revelations of mass online surveillance. The human rights implications of state and private actors’ tracking of our everyday life online, our digital imagination, and our relationships with other people through social media have been thrust into the headlines as a result.This public debate brings longstanding human rights defenders, such as Amnesty, (h)activists, legal experts, and journalists around the table to discuss the practical and political challenges of defending human rights in a digital age; online and on the ground. As human rights NGOs consider the digital implications of human rights abuses, so do technical and legal experts have to consider the design and legislative implications of recognizing that online we have rights too. Official recognition, e.g. at the UN, is not enough. And grassroots awareness-raising about our human rights online is hampered by government policies that undermine rights like Freedom of Expression, privacy, education, and freedom of association in the name of cyber- or state security.This panel discusses the options available for the design, access, and use of the future internet now that the “genie is out of the bottle” as the battle for ownership and control of tomorrow’s internet gathers steam. Caspar Bowden (Independent Privacy Researcher). Twitter: @CasparBowden. This event is hosted by the Media & Communications department; co-organized by the Global Media and Transnational Communications MA Program, Media Forum, and Radical Media Forum (Twitter: @RMF_Goldsmiths ). This event is free! All welcomed! Professor Stuart Hall Building, Room LG01. There will be a reception afterwards.Follow the debate at the Hashtag: #netrightsGold. Looking forward to seeing you all physically or digitally. Might be an idea to create a Facebook event to better spread the word for this amazing event.